There's trouble brewing in the Louisiana swamp -- Bowser can smell it. Bowser is a very handsome and only slightly slobbery dog, and he can smell lots of things. Like bacon. And rawhide chews! And the sweat on humans when they're lying. Birdie Gaux, the girl Bowser lives with, also knows something is wrong. It's not just that her grammy's stuffed prize marlin has been stolen. It's the weird rumor that the marlin is linked to a missing treasure. It's the truck that seems to be following Birdie and the bad feeling on the back of her neck. When Birdie and Bowser start digging into the mystery, not even Bowser's powerful sniffer can smell just how menacing the threat is. And when the danger comes straight for Birdie, Bowser knows it's up to him to sic 'em. Two humans stood outside my cage, a white-haired woman and a gum-chewing kid. Gum chewing is one of the best sounds out there, and the smell's not bad either. I liked the kid from the get-go. "It was a good mystery which, like in all good mysteries, ended in a lot of cliff hangers. Bowser was always thinking about food, and sometimes it was hilarious. 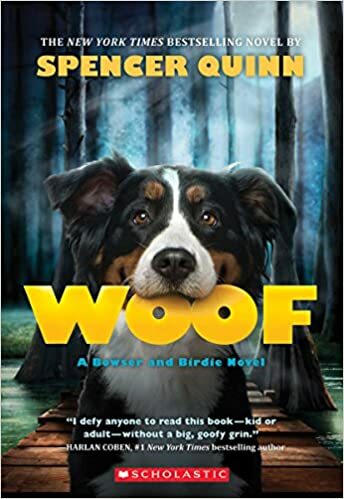 WOOF was an interesting story about a girl and her dog discovering what happened. It was fun, as a reader, trying to figure out what would happen next."